It's the people that make a church and there's no doubt that people filled the pews at Zion Mennonite Church on its 125th anniversary celebration. The sanctuary was full of current and former members and guests, some coming from as far away as Seattle and others as close as Canby to the church on Whiskey Hill Road in Hubbard. Even though Zion's services no longer are conducted in German, the men's choir sang a very old German hymn found in a 1902 hymnal that likely was sung by the church's men as they put the roof on the 1898 building. The church's name may have come from that hymn entitled "Who will go along with me to Zion." Pastor Mathew Swora was able to translate the hymn into English, but the choir sung it in German. 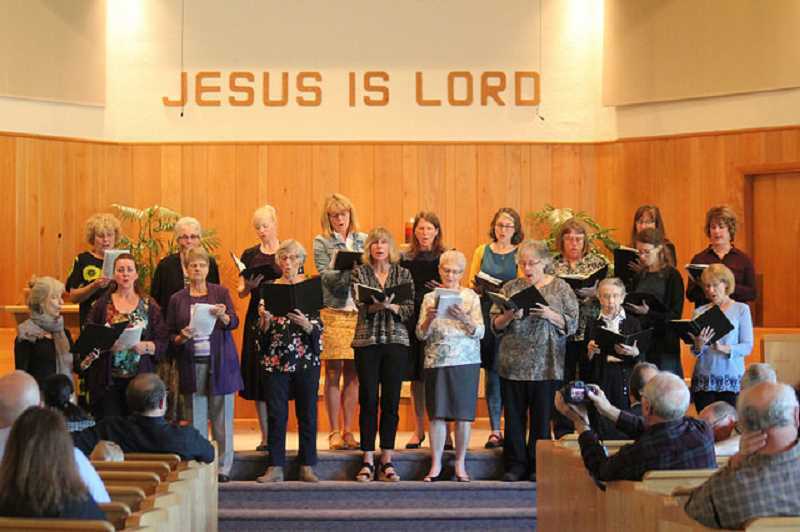 The women's choir sang two songs and the combined choir one along with the usual hymns and songs. Frank Howard, the children's story leader, worked with the children to build blocks for a facsimile of the church. They finally succeeded on the fifth try to build one on a solid foundation after four others were rejected. The guest speaker, Dr. John Roth from Goshen, IN, gave three presentations; a sermon on key Anabaptist scriptures, The Great Commission and No Other Foundation than Christ. Another considered foundational biblical truths and current contextual realities allowing an environment for strong disagreement and another on the global Mennonite World Conference study of Anabaptism growth predominantly in the Southern Hemisphere into South America, Africa and Asia. Roth also met with two other groups, one on Saturday afternoon at the Mennonite Heritage Center and Sunday evening with Goshen College alumni at a residence. The church has its roots in the Anabaptist religion, which advocates peace and follows Jesus' teachings. It is somewhat different from the Amish, which also is based on Anabaptism. The Amish do not use technology and typically wear an older form of dress. Zion Mennonites do use technology and may choose to dress in modern clothing they also have Sunday School and lots of music with their services. Dress has mellowed, and the white prayer bonnets women used to wear to church have all but disappeared—except in pictures. No longer are services conducted in German, but somewhere in the library is a German hymnal. Mennonites also provide service through volunteering all over the world. Many of the new congregations are in South America and Africa including Brazil, Honduras, Libya, and even Burkina Faso. Congregants also have been available, in partnership with FEMA, to help with disasters in U.S. But it's the history and the caring that make this church so unique. The congregation is like a family. If someone is sick, loses their job, has a death in the family or is struck by some other problems. The congregation takes over providing funds, meals, babysitting or whatever is necessary.